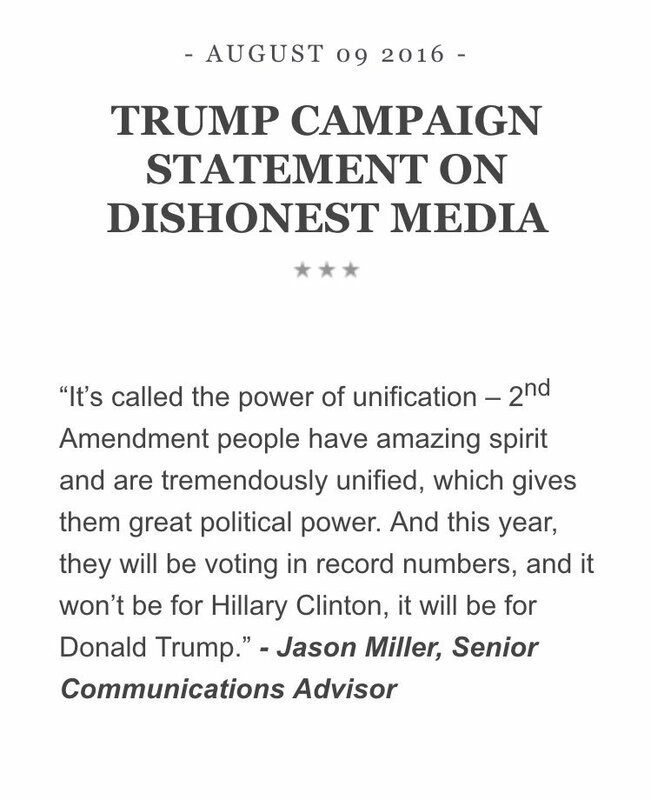 The Trump campaign was quick to issue a statement. But if you listen to the context – Trump is talking about Clinton appointing judges, which would happen AFTER the election. So that explanation doesn’t work. Whether or not he is suggesting that his opponent be assassinated or the judges she would appoint is immaterial. This country has long prided itself on the peaceful transition of power based on voting by the people in elections. These words from Donald Trump were spoken at a time when the ground is already being primed for a confederate insurgency. It is extremely dangerous rhetoric and anyone who doesn’t condemn it in the strongest possible terms is complicit. * I’ve said several times that I won’t bother with trying to follow Donald Trump’s flip-flopping on policy. This video is a bit long – but pretty much covers what drove me to that conclusion. * Yesterday I suggested that someone should keep track of all the Republicans who are defecting from the Trump campaign. Today, TPM started doing exactly that. Donald Trump hasn’t exactly made it easy for his fellow Republicans to wholeheartedly support him. A flood of prominent GOPers, from current elected officeholders to former national security and foreign policy officials, have either withdrawn support for the GOP nominee or voiced strident opposition to his comments in recent weeks. It can be tough to keep track, so we’ve compiled a handy guide to keep it all straight. * Given all the focus on the presidential race, this story is not likely to get the notice it deserves. The Justice Department has concluded its civil rights probe into the Baltimore Police Department and officials are expected to release a highly critical report of the agency on Wednesday, according to two people familiar with the matter. The lengthy report details what federal investigators concluded after a so-called “pattern or practice” review that lasted more than a year and examined the Baltimore department’s use of force, searches, arrests and other policing methods. The probe found discriminatory policing practices, and local and federal officials will now have to negotiate a court-enforceable order to ensure future reforms, one of the people said. * Finally, I don’t know about you – but after all that Trump ugliness, I feel a need for some soul-cleansing. Here’s a tune from Amos Lee that I often turn to for that.